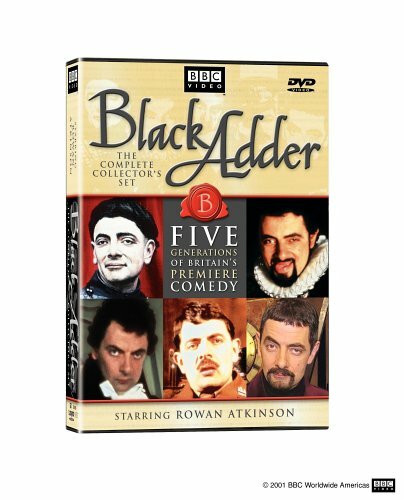 Rowan Atkinson stars as the sniveling, scheming Edmond Blackadder in all of his appalling incarnations: as Richard IV's younger son, as a courtier to Elizabeth I, as Prince George's butler, and as a WWI army captain. 12-hour gift set includes the 4 complete series (1983-89, 24 episodes on 8 cassettes or 5 DVDs) plus a 15-min. special, "The Cavalier Years," never seen in the US. DVD extras include archival interviews, outtakes, Karaoke, cast bios, and more.